Are you on the lookout for the perfect retreat this holiday season? Do you wish to visit a place which offers the perfect blend of adventure and peace? Opting for a Sikkim tour can then be a magical and remarkable experience for a lifetime! Basking in the splendid enchantment of the stunning lakes in Sikkim can indeed be an unforgettable experience altogether. Located atop picturesque mountains, your journey to them can itself be a rewarding experience. Whether you are an adventure enthusiast or a peace seeker, the place can provide you with an abundance of places to visit. Thus, visiting these lakes during the Sikkim trip is a must for every traveller! Here is the list of beautiful lakes which you must visit during your Sikkim tour! Opt for a comprehensive North Sikkim tour package to visit the famous Gurudongmar Lake. Nestled amidst snow-covered mountains and snow-clad peaks, it is a sacred lake for the Hindus and Buddhists. The lake is widely acknowledged as ‘the crown jewel of Sikkim’. As per the faiths and beliefs of the locals, it is believed that when worshipped, the lake grants the wish of couples who do not have children. This ethereal lake in East Sikkim is one of the most beautiful Sikkimese offerings which you cannot miss out no matter what. Also termed as ‘Changu Lake’, the lake is situated amidst enchanting glaciers and lofty peaks. A 40 km drive from the capital city, the Tsomgo Lake spreads around a vast area of 1km with a 15m depth. The lake is even a paradise for every bird lover and it attracts numerous migratory birds every year. One of the most popular tourist attractions in Sikkim, the Khecheopalri Lake is regarded as a holy lake by the locals in the state. Worshipped by both Buddhists and Hindus, tourists can enjoy spectacular sights of this beautiful lake. The lake is situated at a towering height and is an integral part of the valley of ‘Demazong’. What’s interesting is that leaves are not allowed to float on this lake. 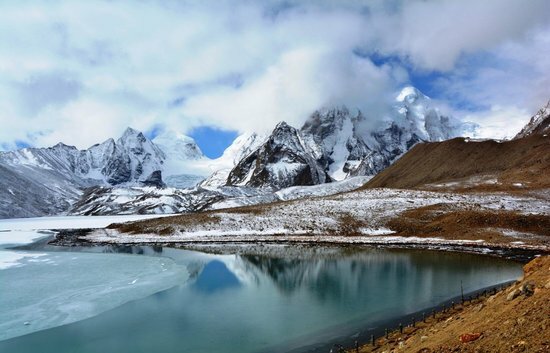 While on your way to the enthralling Dzongri Trek or the Goecha La trek, tourists can witness this turquoise lake romancing the lofty snow-clad peaks of Sikkim. Nestled between two mountains, the Samiti Lake is one of the tiniest lakes in the state. While opting for an assorted Sikkim tour package, the enchanting appeal of the lake bounds tourists to take a pause in this region. The Karthok Lake is one of the most sacred lakes in Sikkim and is even known for its serenity and appeal. The locals believe that with the emerald water, every wish made with a pure heart is heard and fulfilled by the Almighty. The locals here organise a grand celebration every year beside this sacred lake where they thank their Gods for bringing opulence in their lives. So what are you still waiting for? Opt for the best tour package and treat yourself to a memorable Sikkim trip!